I know, I know! It does sound a bit strange and it was one of the biggest leaps of faith EVER but you know what? It’s good too. Without a doubt my margaritas all have a couple of things in common as most do. Reposado tequila, real orange liqueur and fresh lime juice. It was not that big of a leap to go from there to the Pumpkin Spice Margarita. Really. The difference in almost all of them is simply what I decide to add for a unique flavor. And I’ve done a lot of margaritas too. My favorite old fashioned one, basil and jalapeno, blackberry and blood orange and…well, you get my drift right? So I was thinking about a margarita for today’s Friday Cocktail segment and what I would do that was seasonal and I could hardly miss the huge pumpkin I had just brought in from my front porch. Why not? I knew I had some pumpkin puree from last year in the freezer (boy did I time that right…just one!) so I was on it. Consider how the world has gone Pumpkin Spice crazy I decided to do the same. I made a pumpkin simple syrup flavored with cinnamon and nutmeg and just added that to my standard ingredients and voila…here you go! When I say a leap of faith I mean it. This cocktail should have been made and at least photographed yesterday but I was trying to catch up from a post on Wednesday and another yesterday so it didn’t happen. I’ve pretty much missed doing any cocktails during my recuperation from cataract surgery but come on…enough is enough. I wanted to make one today AND enjoy it this evening with friends so I plowed through and hoped against hope I would like it! And I really did. 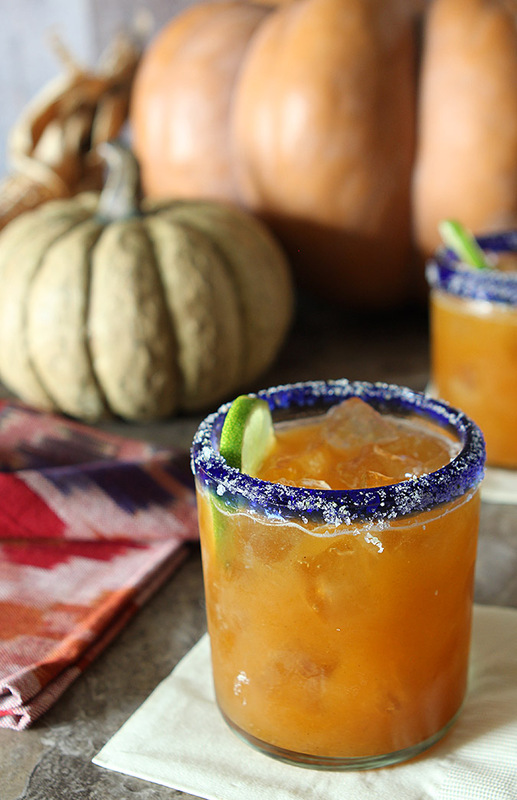 I used the pumpkin to make a simple syrup so it’s not too heavy handed in the cocktail but I think of most importance is the type of tequila. Whereas a Blanco might be perfect for the fruity margaritas of summer, I decided that I had to use one with a bit more oomph to work with the pumpkin concoction I made for the flavoring. Reposado it was and the two worked together perfectly. Because pumpkin is so bland I decided to use the ubiquitous ‘Pumpkin Spice’ flavor that is so popular today. It’s basically the combination that makes holiday pies taste so good…some pumpkin, brown sugar, cinnamon and a bit of nutmeg. Altogether a spicy and smooth concoction that paired beautifully with the fuller tequila, orange liqueur and a bit of lime juice. This would be pretty much the perfect cocktail for Thanksgiving. Or tonight. Cheers! Combine all ingredients in a saucepan set over medium-low heat; whisk together until smooth. Simmer for 20 minutes, stirring occasionally. Remove from heat, cool, and strain into a container. Chill two cocktail glasses. Rub a lime wedge around the rim and dip the rim into a saucer filled with a combination of equal parts kosher salt and sugar. 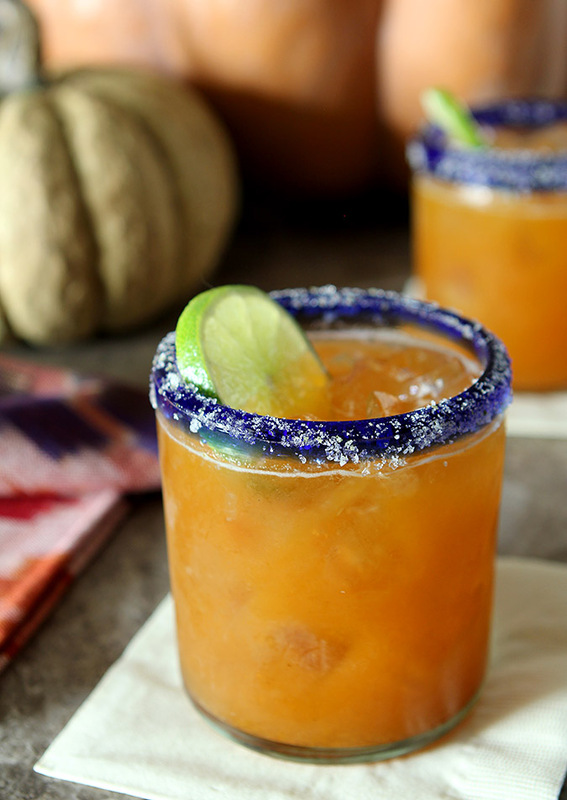 Fill a cocktail shaker with ice and add the tequila, orange liqueur and pumpkin spice syrup. Shake until chilled. Fill the rimmed glasses with ice and pour the mixture into the glasses. Once the syrup has strained out from the pumpkin, use it for toast or waffles...it's like pumpkin butter! Fun drink! And Reposado is the perfect tequila for this — you need something with oomph to stand up to pumpkin spice, and that’ll do it. Very creative. And tasty, no doubt. Thanks!